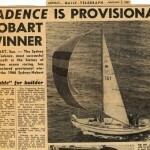 Cadence is one of MHYC's most successful yachts, being 1966 Sydney to Hobart winner, three times Blue Water Champion, and three times Sydney to Brisbane winner. 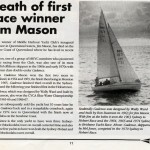 Inspired by builder and co-designer Ron Swanson's ocean racing success in Carmen, and the beauty of the Wally Ward designed Janaway and Caress, owner Jim Mason wanted a cheap. practical boat that could win. 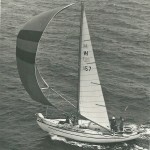 Jim made the spars, deck hardware and rigging: sails were by Peter Cole. 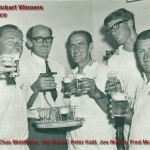 Measuring 30 foot 9 inches LOA, 24 foot LWL, 8 foot 6 inches in the beam and drawing 5 foot 6 inches, she was at the time the smallest boat ever to win the Sydney to Hobart Yacht Race. She was extraordinarily strong, being double-planked in Oregon to a thickness of 1 and 1/8 inches and with two layers of 5/8-inch ply for the deck. In contrast, she had an ultra-lightweight, all canvas and allow tube interior. 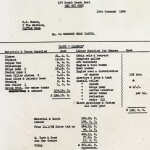 Features such as a bucked to a sink, and the main hatch doubling as the chart table, kept the weight down. 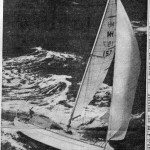 Designed to be raced with a crew of no more than five, she had and ultra-functional, single spreader, masthead rig, with just two deck winches, tiller steering, minimal instrumentation and nothing that wasn't essential for racing. 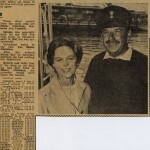 She was exceptionally fast in confused seas, light winds from any direction and heavy winds on the nose, but most of the credit for her success must go to Jim for his tactical and navigational skills. 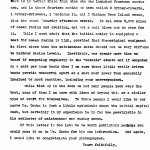 But despite her small size, Cadence was a dry and comfortable boat to sail. 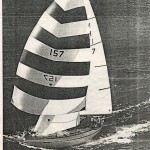 With a freeboard forward of a raised deck, a large fibreglass dodger to duck under and the skipper's philosophy of 'a dry crew outlasting a wet one' in long races, she was a pleasure to race or cruise. 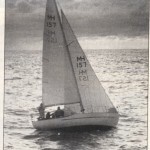 The long, conventional keel made steering easy, and broaches were very rare. 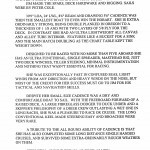 A tribute to the all-round ability of Cadence is that she also completed some long-distance, single-handed cruises, and survived some extraordinarily rough weather. 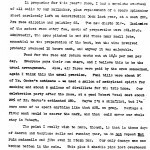 She's still around today, as good as new. 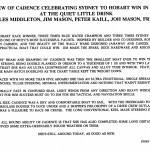 Note: The Carmens have spread all around Australia since Jim Mason's success in winning the Hobart race with Cadence, also from Middle Harbour Yacht Club. 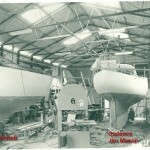 The first 2 Carmens, Cadence and Cavelier were built side-by side by Ron Swanson at Dee Why. 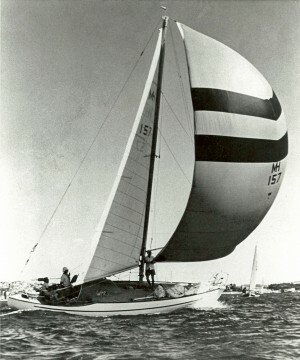 Camile was also built by Ron Swanson who sailed he most successfully, taking her to the Admiral's Cup and later competing in the Sydney to Hobart Yacht Race.